We reached the Quarter final stage at the World Cup football in Russia. Things are getting really serious now because all the teams in the Quarter finals have a good chance to reach one of the 3 top positions. There are a few sursprises already this tournament in Russia. The hosts are one of the surprises. Nobody expected them to survive the group stage and now they are in the quarter finals. In the quarter finals they face a strong Croatia. Spain, Argentina, Germany and Portugal are already eliminated from the tournament which is a huge surprise. Germany is the current World Champion and they got eliminated in the group stage by Mexico and Sweden. This is the biggest surprise so far this tournament. Nobody thought Russia would survive the group stage. After they got second in their group they played against Spain. And they defended perfectly. Spain only got a few chances but they where playing very weak. Russia was well organised and Spain played without any idea. russia managed to score a penalty after Pique made a hand ball. Before Dzjuba made it 1-1 from the penalty spot, Russia already scored an own goal in the 12th minute. An unlucky goal from Ignasjevitsj. But all went well for Russia after the 1-1. Spain didn’t had a clue how they could beat the Russian defence and after 120 minutes penalies decided this game. 2 Spannish players missed and Russia qualified for the Quarter finals. They now play against Croatia. One of the best teams in the group stage had a very difficult game before the quarter finals. Croatia faced Denmark in the second round and after a great start of the match the game ended 1-1 after 90 minutes. Denmark and Croatia both played very weak during this game. A bit of a surprise because Croatia played a few amazing games in their group stage. They won 3-0 against Argentina and 2-0 against Nigeria. Against Denmark a few players didn’t reach their level. 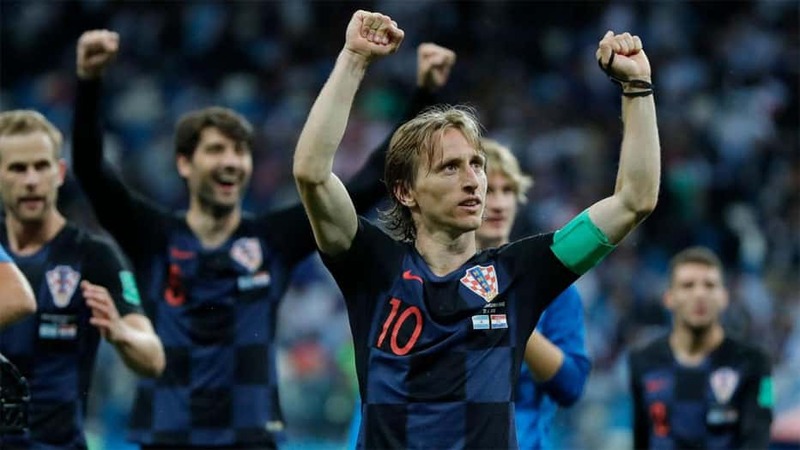 Modric, Perisic and Rakitic did not reach the high level the normally have. But hey, every team has 1 bad game during a tournament. Maybe this was the bad game for Croatia. And maybe they can now reach the finals. In the quarter finals they face Russia. top favorites Brazil reached the quarter finals after beating Mexico 2-0. Now they face one of the other top favorites Belgium. Brazil is in form and won their last 3 games on this world cup. They started a bit slow with a draw against Switzerland. But after that game they won every game and scored at least 2 goals in every game. the game against Mexico was a rather easy game and the result was a fair result. Now they have to play a lot better when they want to beat Belgium. Neymar is in form but he also gets a lot of questions from the crowd. He is diving and complaining all the time. The crowd is getting sick of this kid. Will this get against him and his team? My personal favorites to win this world cup are Belgium. They have by far the best squad. In every position they have a great player. Their midfield with Hazard, de Bruyne and Witzel is world class. With an in form striker (lukaku) they can score a goal in every game. In the last round Belgium had a heavy game. They almost lost against Japan. In the second half they where down 2-0. But they still managed to win this game in the 90 minutes. A few great achievements gave them 3 nice goals. And in the last minute they sealed the game with the perfect counter attack after a corner kick of Japan. Now they face other favorites Brazil. This is going to be an epic game. The biggest surprise in the quarter finals are Sweden. They won their group with Germany and Mexico and managed to beat the though Swiss in the last round. It wasn’t a great game but they looked so solid during the game. The Swedish team is not full of great players but they have such a great team mentality. Every game they play in a god organisation. Against Switzerland they created a few good chances but only a deflected shot went in the back of the net. They finished the game 1-0 and are now up to play against the English. Everybody in England is now singing “It is coming home”. Referring to the world cup coming back to the home of football. The English looked solid against Colombia till the 94th minute. Colombia managed to score a 1-1 in the final minute of stoppage time. Before this goal Harry Kane had made it 1-0 from the penalty spot. Before this game England had 3 penalty shoot outs in a World Cup and they lost all 3. This time they coped with the presure and Pickford became the Hero after stopping the final penalty of Colombia. England now faces a weaker side as Colombia. But can they beat the well organised Swedish team? Or will it be a new penalty shoot ou in Samara? It is time to give you our predictions for all the games in the quarter finals. We give you a short preview of each game and we tell you what we think about the game, At our preferred betting partners we select the best odds for our predictions. And when you want to bet on the game you can click the “bet on this match” button or you can register a free account at one of our reliable betting partners in the table underneath. All betting websites in this table are 100% reliable and they all offer you an interesting welcome bonus. Uruguay is playing very good at the moment. They have a solid defence and a great attacking force with Suarez and Cavani. It is not sure if Cavani can play against france because he left the field against Portugal with an injury. It is key that Cavani plays because he is a player who can make a difference during an important game like this. France started the tournament pretty weak. They didn’t play well but they managed to finish top of their group. And they reached the last 16 pretty easy. In the last game they played much better and they beat Argentina with 4-3. Mbappe and Griezmann are getting better and better and that is good news for France. The defenders of France are not the best and that is where Uruguay can make the difference. Can Mbappe and Griezmann beat the solid defence of Uruguay? And how many goals can Cavani and Suarez score against the weaker france defenders? I predict a 2-1 win for Uruguay after 90 minutes. And Suarez to score the first goal. You can place bets at our preferred betting partners before or during this game. All the reliable betting websites offer you pre match betting and live betting. Underneath you find the most interesting odds and betting tips. Click the odds or the betting button to open the website of Bethard. Open a free account and place some bets on this amazing quarter final match. this is probably going to be the best quarter final of the tournament. Maybe even the best game in the tournament. At the start of the World Cup both Belgium and Brazil where one of the top favorites to win this world cup. And now they play eachother in an epic quarter final match in Kazan. The whole world will be watching this game on friday night. Belgium has had some amazing results. They won all of their games and they beat Japan in the last minute of the game after being down with 2 goals. Belgium became first in their group with England. Even when a second spot would have been better. Now they face a great Brazil. brazil is getting better every game. They have Neymar who get more and more hated by the crowd. With his dives and crying he tries to foul the referees. Will this get against him and Brazil? An awesome game to bet on. The game is going to be very exiting but betting on the game will make it even more exiting. There are a few interesting odds and bets available. Underneath we gathered them for you. A great achievement from Sweden to reach this stage of the world cup. And they only lost one of their previous 4 games. Only Germany could beat the Swedish in the last second of the group match. Sweden deserved to win that game. The England squad is on paper much better then the Swedish one. But Sweden manages to play in a decent organisation. Every match they play the same and they play from their organisation. England has a great squad with Harry Kane in form. He scores every game and wants to be topscorer this world cup. I think Sweden will lose by 1 goal. And England will score from a penalty (Harry Kane). I predict a 1-0 or 2-0 win for England. In Samara England wants to beat Sweden and bring the world cup “home”. At our preferred betting partners you are able to bet on this game and get the highest possible odds. A great game for Russia because they didn’t thought they could reach the quarter finals. And Croatia is top favorite in this game. So Russia can do exactly the same as they did in their game against Spain. They can organise their defence and try to keep a clean sheet. With their quick wingers and big striker they hope to score a goal from set piece or a counter attack. Croatia is in my eyes the big favorite to win this game. They have such a strong and talented midfield. In their game against Denmark their midfield played very weak but stil they managed to win the game. Every team plays one bad game during a tournament. Croatia could reach the finals when they win against Russia. But can they cope with the huge Russian crowd in Sochi? I predict a though game but Croatia is the better team and they will beat the Russian team with 2-0. 1 Goal from a penalty and one from one of the midfielders. Add our preferred betting partner Bethard you get the best odds for this game. Underneath I selected the best odds for this game. Click on the odds or the button and place your bets today. With our predictions and tips you can increase your winning chances.